Open your own online shop with Australia's best ecommerce solution. Find out just how easy it can be to rise above your competitors and increase sales with our feature packed, easy to use ecommerce website solution. 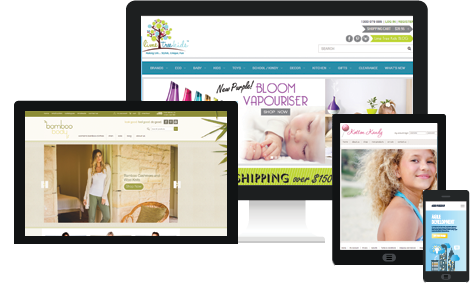 Since 2000, we have been developing world class ecommerce systems for businesses all around Australia and the world. With clients in Australia, New Zealand, Dubai, USA, Canada and Europe from small stay at home mum businesses right up to multi national organisations, we have the experience needed to ensure that your ecommerce website is developed on time, on budget and is powerful and easy enough to use to help your business grow well into the future. Check out our key features using the top menu bar or simply request a quote for more information on how we can help you get the very best platform to succeed in the ever growing market of ecommerce. Automatic synchronisation VEND P.O.S. to keep stock levels synced between your shop, online store, market stall, etc. Cloud based technologies allows unlimited staff members to manage products, process orders, update content and access statistics and more from any computer, anywhere in the word. Our easy to use content management system receives rave reviews from all of our clients on how quick and easy it is to manage. Bulk update, stock control, stock alert emails and our unique (snapshot of your business) dashboard makes managing your online business efficient, easy and fun.